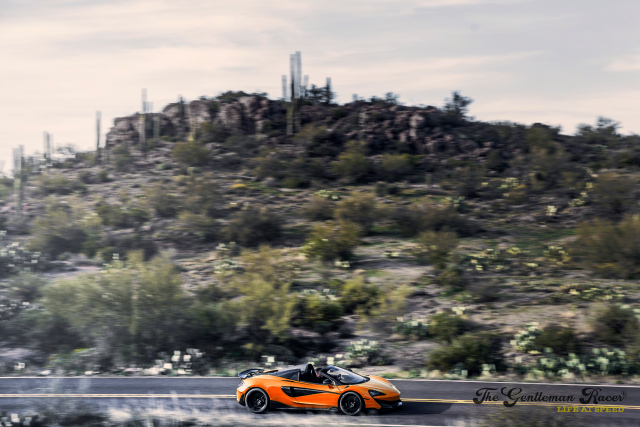 I was recently invited out by Pirelli Tires and McLaren to spend a weekend in the new 600LT Spider bombing around Arizona and track testing out at Arizona Motorsports Park. 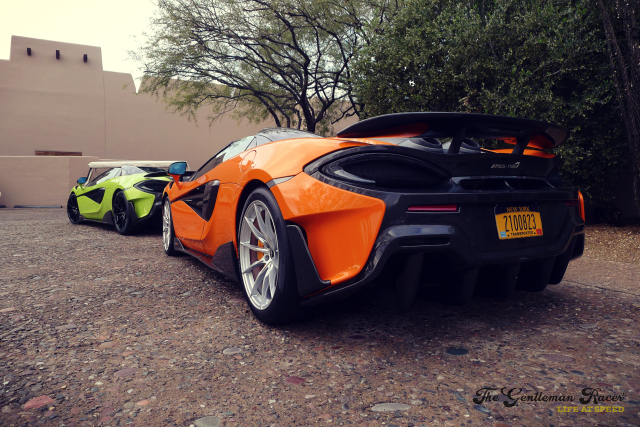 I arrived at the Four Seasons in Scottsdale and enjoyed dinner with the Pirelli and McLaren team. We were also driving the new McLaren 720S Spider, but I can' tell you about that car just yet. The next morning I was assigned a Mayan Orange 600LT Spider and given a route, my drive partner would be my good friend and popular YouTuber, Emelia Hartford who was at the event to film for Daily Driven Exotics. 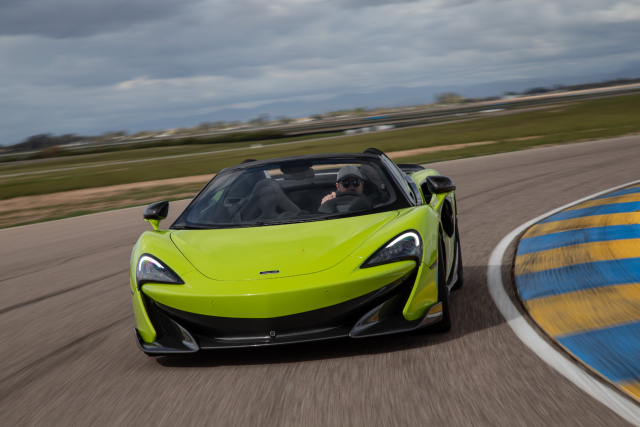 Having driven a few McLarens in the past, most recently the 570S Spider, I was excited to get behind the wheel of the new drop-top version of the 600LT. Not surprisingly McLaren took everything it learned from the 650S, 675LT, and 570S Spiders and made the 600LT lighter, faster, and better performing. In fact, the 600LT Spider is 220lbs lighter than the 570S Spider, and just 110lbs heavier than the 600LT Coupé. Sliding into the all-business interior of the 600LT lets you know that while this is a Spider, it is still a performance, track-focused vehicle like the coupe, I found the seat firm but comfortable and the basic layout was similar to the other McLaren cars I have driven. The 600LT doesn't have the conversation starting fold away track dash like the 720S, but in my opinion, the 600LT's clean functional interior is the best one yet from McLaren as far as functionality. 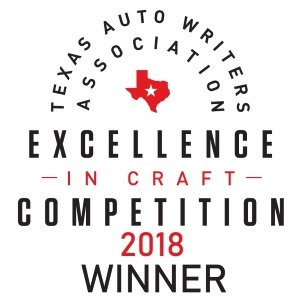 But while it wins my praise for functionality, it is a bit on the bland side for a car that comes in Lime Green, Mayan Orange, and Curacao Blue. The only interior color option is Black, Black with Orange Alcantara, or Black with Carmine Red inserts which don't even really match the Vermillion Red exterior color that is offered. Based on the McLaren configurator you have more optional colors for the seat belts than the seats. With the LT Super-Lightweight CF Seat option, you can get Black or Orange, the latter being the only dramatic interior option available, just don't order the orange seats with yellow seatbelts on a Lime Green car, please. You can play with the configurator here if you want to build your own. Lifting the nose, pulling the paddle into first gear, and rolling out of the Four Seasons parking lot, the 600LT Spider in comfort mode is as easy to drive as a Honda Civic, which is surprising considering it is essentially a street-legal track car. But comfort mode is for the weak and we quickly switched over to track-mode to see what the Spider could do as we carved some canyons in the foothills above Scottsdale. 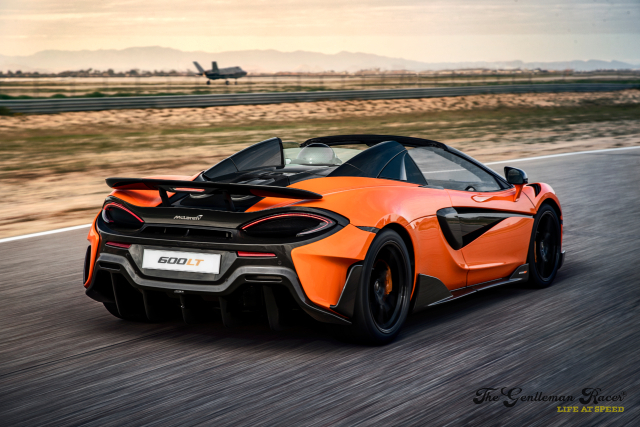 The 600LT Spider comes with the same 3.8-liter twin-turbocharged V8 that makes 592bhp and 457lb-ft of torque with the iconic, flame-spitting, top exiting exhaust, which sounds much more exciting without a roof. The dual-clutch seven-speed Seamless Shift Gearbox, allows the 600LT Spider to reach 0-62mph in just 2.9 seconds, only 0.2 seconds slower than the Coupé. With the top up the Spider will reach 201mph and 196mph with it down. All of this power and handling is channeled through the specially engineered Pirelli Trofeo R tires which are engineered alongside the cars to ensure maximum performance. The tires even have a small MC on the sidewall which designated them as McLaren specific tires. 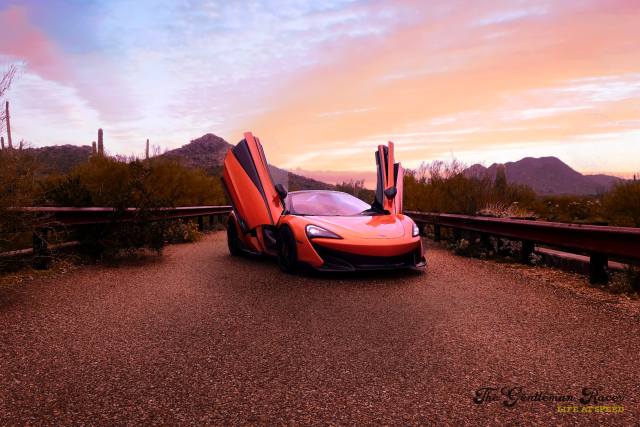 After a nice run through the canyon, we drove through a series of small towns as we made our way towards Arizona Motorsports Park where the McLaren team was going to let us take the 600LT to the track. 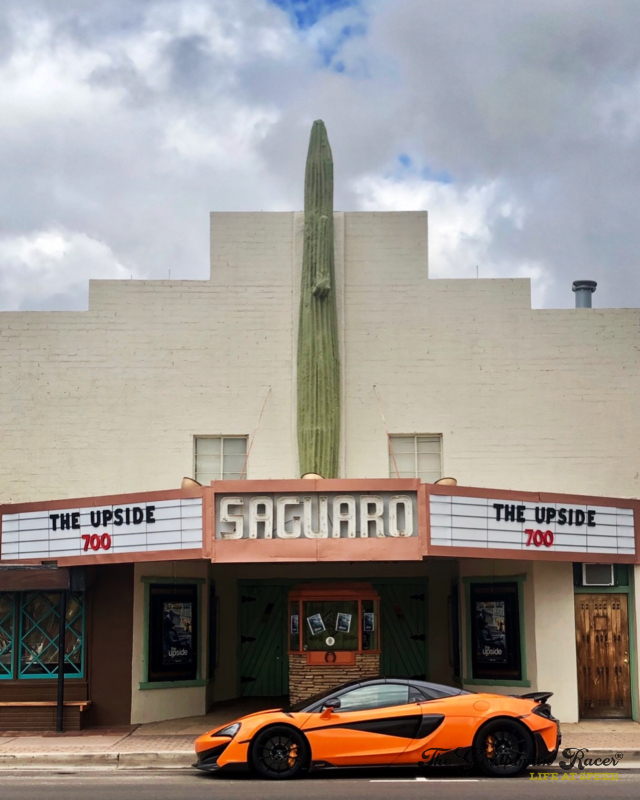 The 600LT Spider was defiantly an attention getter outside of Scottsdale, stopping in Wickenburg there to grab a drink and stretch our legs we had people asking questions about the car and snapping cell phone pics. After a few hours in the car I was surprised how comfortable I was in it, track-focused cars are generally not great road trip cars and other's had reported that the 600LT Coupé had a "hunched over" driving position, but I didn't find that the case in the 600LT Spider. Riding shotgun for a few hours as well was still comfortable and for two average sized people the cockpit is roomy, it even has cup holders. 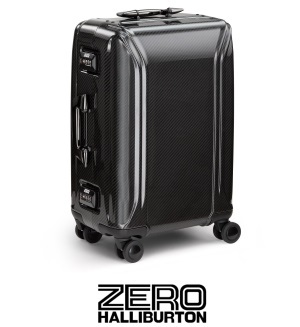 The front truck is also fairly large with 5.3 cubic feet of storage, which means you could get two carryon size bags in there, so long as you aren't overpacked. Arriving at the track we parked the street cars so they could be refueled, cleaned up, while we headed out to our track safety meeting, they had a number of rack cars already set up with cameras. 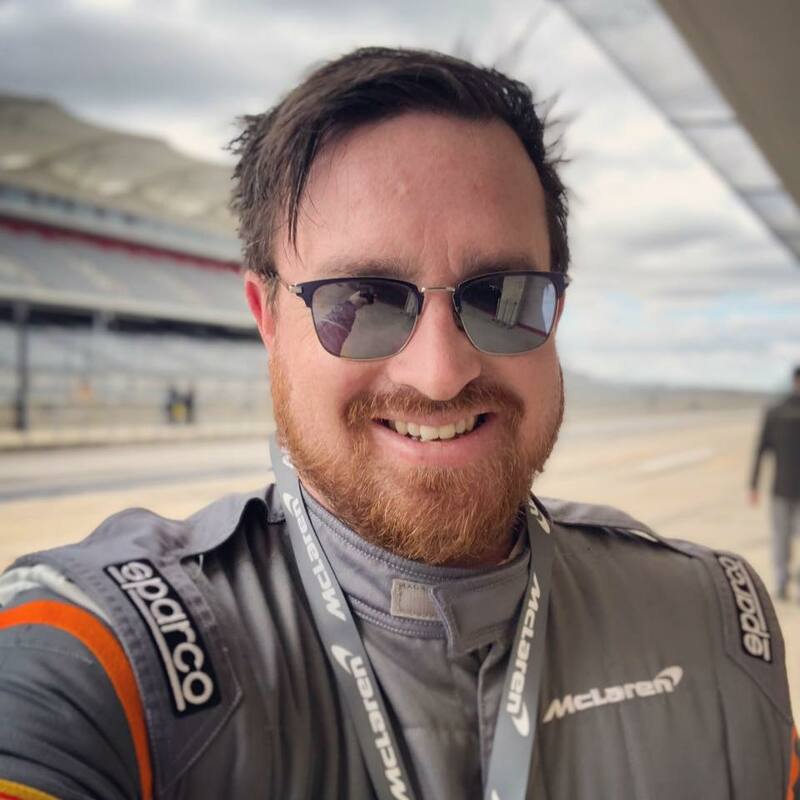 First, we took out a car just to do a few laps and learn the course, then with a pro-driver in the seat next to me, I got to take the 600LT Spider on some hot laps. On the track is really where the 600LT Spider shines, it transformed from a comfortable road car into a full track car at the flick of a switch. 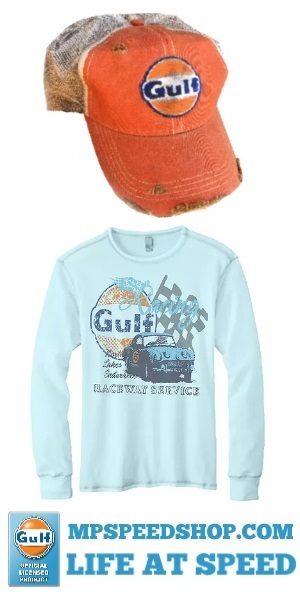 It nimble and lets every driver get right up to their edge without feeling out of control, even when the backend steps out, the car pushes through and you get an even better understanding of its balance and where you can push it harder in the corners, it is an easy car to drive fast. 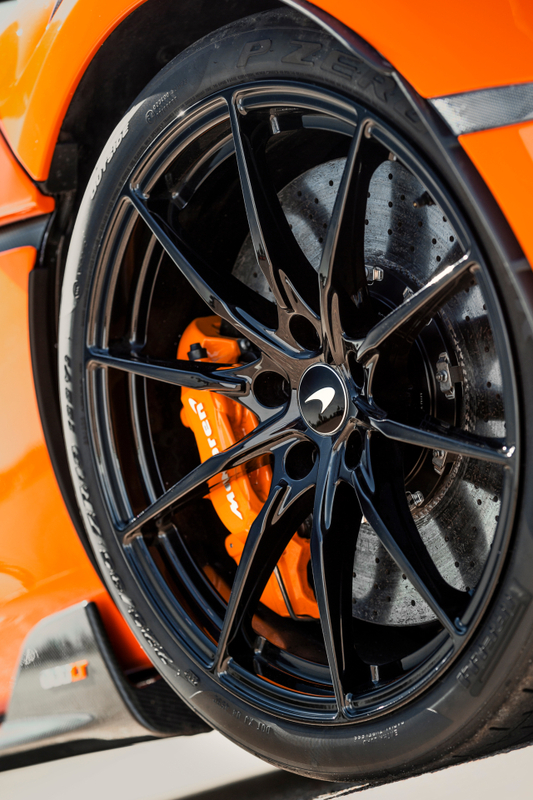 On the track is where you also experience the brakes which were nabbed from the 720S. These lightweight carbon-ceramic brakes coupled to the Pirelli Trofeo R tires allowed me to push harder in the straights and brake far later than I initially thought possible.